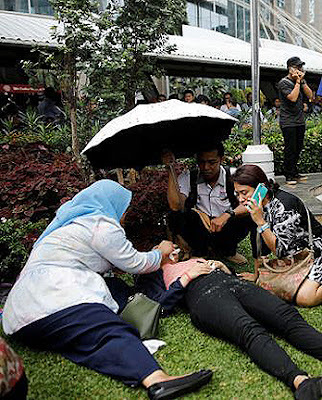 A Tower II floor collapse has occurred at the Jakarta Stock Exchange SCBD in Sudirman, causing a reported 28 injuries so far and paralysing traffic in the financial district. 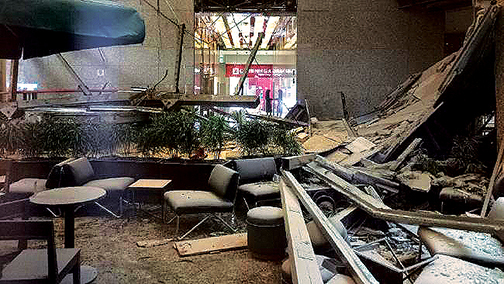 It appears the floor collapsed on a crowded reception area near a Starbucks cafe. Terrorism has been ruled out at this time. The area has been sealed off by police and military personnel with the exception of first responders, the injured being transported to local hospitals as city officials and police begin their investigation into the cause of the collapse. Many of the injured have been transported to Siloam Hospital. Some of the injured have been observed being transported in local taxis as ambulances continue to arrive on scene. The forecourt in front of the exchange has been turned into a triage area for the injured, where many appear to be in a state of shock. A witness reported the floor was crowded with ATM machines and at the time was packed with college students from South Sumatra on a field trip. The 5th Estate will continue to provide updates as they become available. Robert S. Finnegan is a retired investigative journalist residing in Jakarta Indonesia. He is the former International Communications Editor for the Coordinating Ministry for Economic Affairs in 2001-2003 and senior investigative editor for The Jakarta Post.